Throughout history rubies have been sought out as a symbol of passion and love as well as power and wealth. Today rubies are coveted for their brilliant red color and rarity. Bright red rubies are set off a row of diamonds that extends from the earlobe and surrounds each ruby. These earrings have a gently dangle that catches and reflects light as it swings and sways. 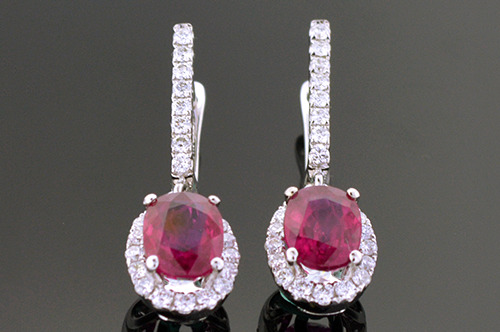 The center of each earring holds one oval cut ruby with a combined weight of 2.52 carat total weight. These rubies have a color of red and are lightly included. Accenting the diamonds are 48 round brilliant cut diamonds that have a weight of approximately .50 carat total weight. Made of 14 karat white gold these earrings feature a hinged back that is very secure.